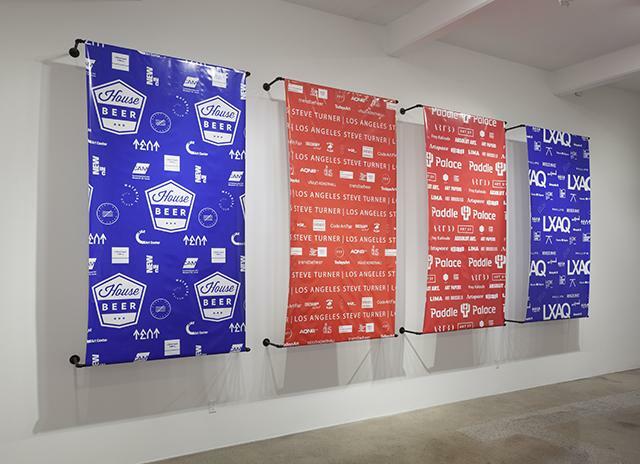 Although art frequently overlaps with many other cultural spheres, the “sports and art” combination often seems stuck on the ‘jock’ vs. ‘artist’ split that proliferates in high school. 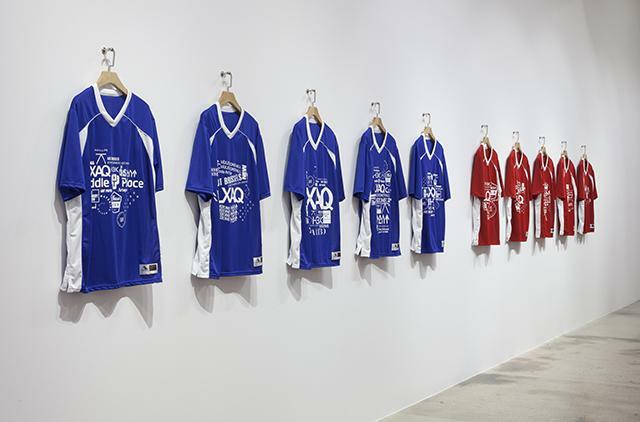 One of the results of artist Jonas Lund‘s ongoing exhibition at Steve Turner is a reconciliation of this divide: Your Logo Here combines the sponsorship, merchandising, live broadcasting, and literal physical activity of sports, with artistic practice and the culture of the art world. 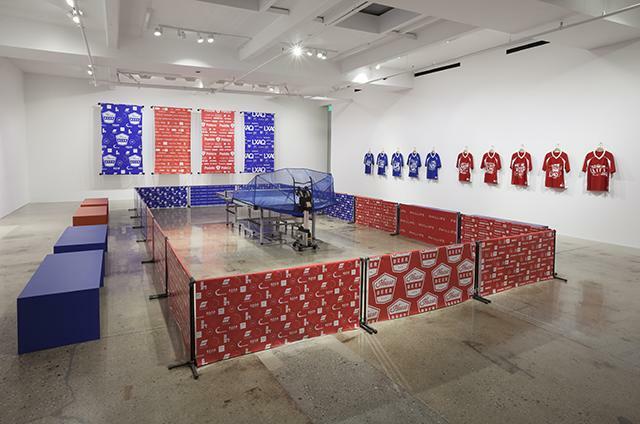 Presenting itself as a miniature sports arena of sorts, Lund has positioned a ping pong table in the center of the Los Angeles gallery, blocked off by banner dividers with sporadic bench seating behind them. Along the walls are vibrant plexiglass plaques and a row of color coordinated sports jerseys, raised high like relics of a championship run. 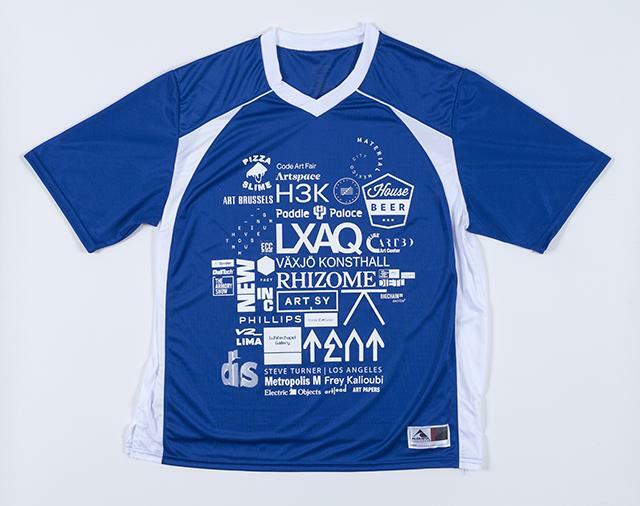 The dividers, plaques, and jerseys are most notable for their lack of team specificity and overbearing abundance of sponsorship logos. 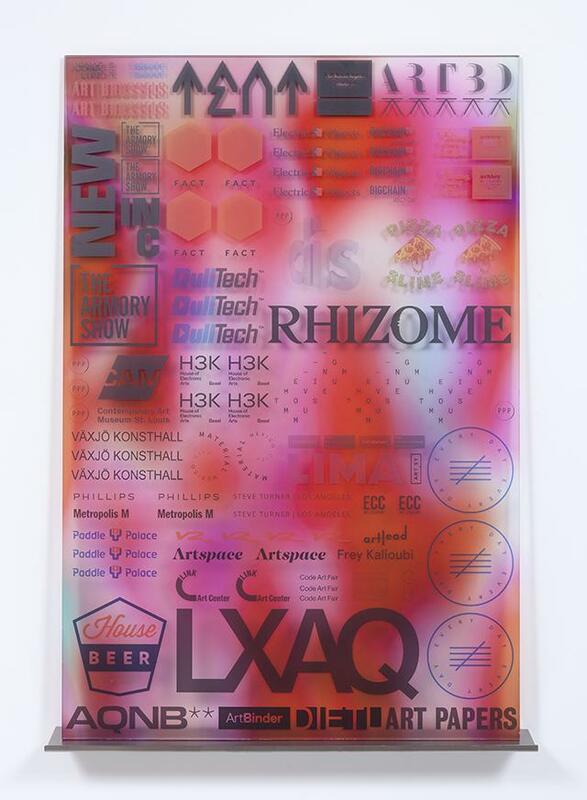 For this exhibition, Lund advertises an array of art organizations, from publications like Rhizome, DIS, and ART PAPERS, to art market powerhouses like Phillips and the Armory Show, in exchange for a series of varied ‘exchanges’ with each group that are not revealed in the exhibition. 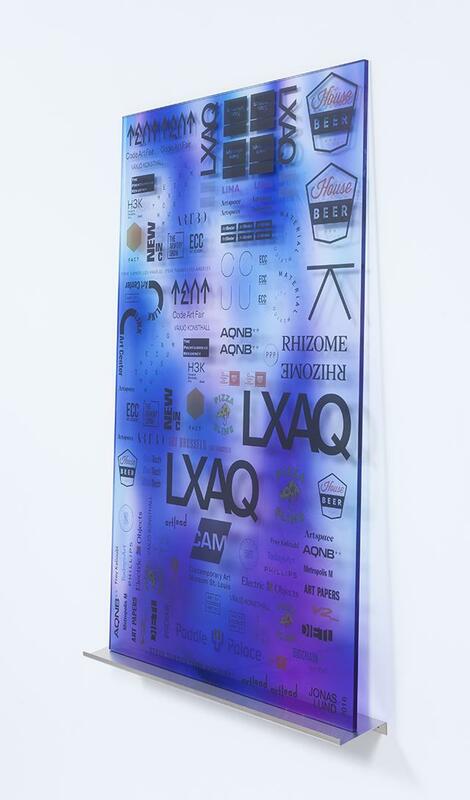 The surrounding elements of art sponsorship lead us to the literal centerpiece of the exhibition, the ping pong table. 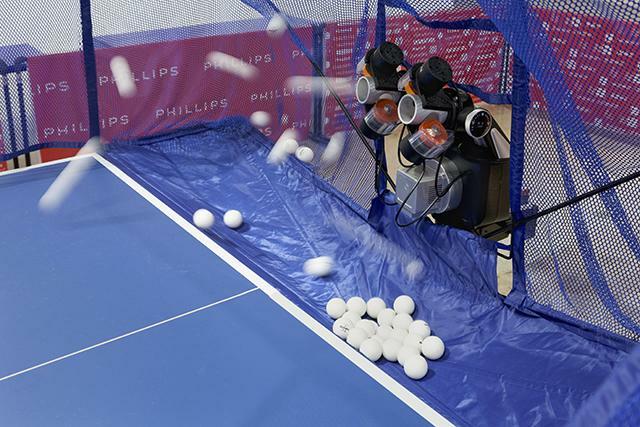 Lund adds an element of interactive art by inviting the viewer to play a round of ping pong against an unorthodox challenger: a faceless, mechanized robot, live streamed on Steve Turner’s Facebook page from an aerial angle, akin to traditional sports broadcasting. 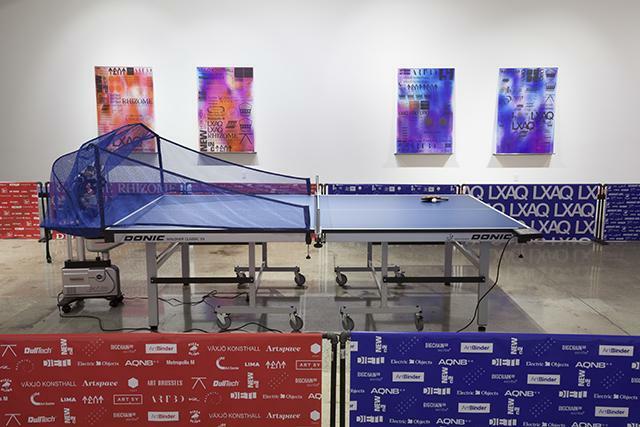 View Jonas Lund’s Your Logo Here at Steve Turner until October 8th, and be sure to stop by on October 1st between 6-9PM to participate in (or watch) a human vs. human ping pong tournament that will take place in the gallery. More of the artist’s work can be found here.